The first exhibition of the spring semester in the COS Art Gallery will be Threading the Lines, an exhibition of custom-made costumes, concept sketches, photographs and footage from the COS Theater Department’s production of Picasso at the Lapin Agile, a comedy by Steve Martin. 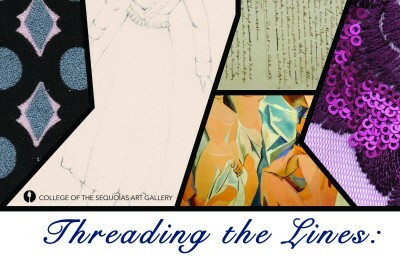 The Threading the Lines exhibition will run from Tuesday, January 29 through Friday, February 22. There will be an interdisciplinary presentation with COS Professors Allyson Sullivan, Larry Owen, and James McDonnell on Thursday, January 31 from 4:30-5:00 p.m. in Sawtooth 326. Followed by the opening reception in the gallery from 5:00 – 7:00 p.m.. The COS Art Gallery has never featured an exhibition of this kind before. From the details down to the type of ribbon used on these exquisitely crafted costumes, first conceptualized through hand-drawn sketches by COS Professor James McDonnell, a viewer coming to the gallery will be able to see up close the costumes created for the November 2018 production of Picasso at the Lapin Agile. If you are unfamiliar with the premise of this witty comedy, it is set in a bar in Paris, the year is 1904, and through random happenstance Albert Einstein, Pablo Picasso, and “A Visitor from the future” (in blue suede shoes) meet just prior to their “genius” status. Through the multilayered dialogue of the small cast of characters, the visual design of the set and costumes were intentionally created through influences of fashion such as Coco Chanel (1883-1971) and Charles Frederick Worth (1825-1895), historical artists such as Renoir, Manet, and Picasso, as well as, iconic fabric patterns worn by Einstein inspiring the design of a stained glass window featured in the bar. An audience member experiencing the production may not consciously pick up on some of these details as the engaging performances truly carry the show, however this exhibition aims to highlight the complexities of creating such an experience as the characters are transformed through the costumes and stage set they are performing in. James McDonnell has been teaching in the COS Theater Department since 2001. He teaches courses is acting, musical theatre, costume design and construction, make-up, and cinema. His costume design and construction students often are the ones that make the costumes in-house for each production. It is through tremendous training and rigor to get the look and style of the pieces just right for each particular production, along with ensuring it will functionally work for the specific actor it is being made for. The COS Theater Department’s rendition of Picasso at the Lapin Agile was also made possible through the incredible efforts of Co-Director Schyler Mayo, Mason Beltran Garcia, Cindy Nunez Herrera, Sophie Kirkpatrick, Steve Lamar, Chris Mangels, Nick Terry, and the cast; RL Preheim, Tom Nance, Brett Clevenger, Natalie Ezelle, Jennifer Powers, Uriah Madrid, Alex Cardoza, Bella O’Keeefe, Haley Ruth Spencer, and Chandler Fairfield. 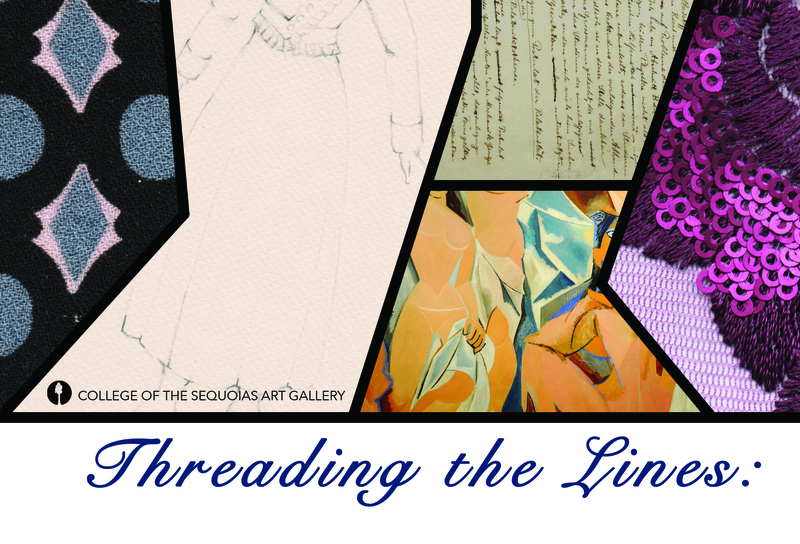 Threading the Lines will open Tuesday, January 29 – Friday, February 22. The COS Art Gallery is located in the Kaweah Building Rm 214 with open hours Tuesday through Friday 11:00 a.m. until 4:00 p.m. On Thursday, January 31st the gallery will be open from 11:00AM to 7:00PM for the opening reception where refreshments will be served. Prior to the opening there will be an interdisciplinary presentation with COS Professors Allyson Sullivan, Larry Owen, and James McDonnell from 4:30-5:00 in Sawtooth 326. Free parking will be available in lot 7 during the evening of the presentation and reception. To see images of the exhibition, check out the College of the Sequoias Art Gallery Facebook page. To contact the COS Art Gallery, feel free to call at 737-4861 or email the gallery director, Amie Rangel at amier@cos[dot]edu.